I just got back from Key West celebrating my second anniversary. I still feel like a newlywed, albeit an inappropriately old newlywed, as I like to say. 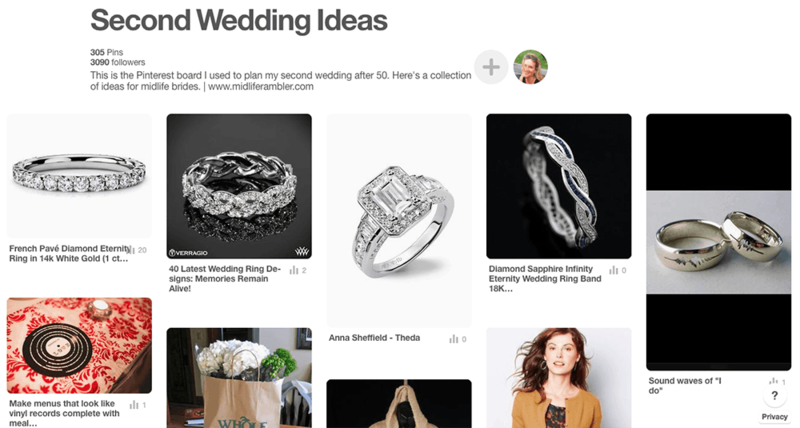 So to celebrate my anniversary, I thought I’d look back a little bit and write about how helpful Pinterest can be for wedding planning, even for midlife brides. I’ve written before about how much I love Pinterest. In fact, I wrote that first sentence and didn’t come back to this post for 30 minutes because I opened Pinterest “for research” and got distracted. That’s a pretty common occurrence for me. 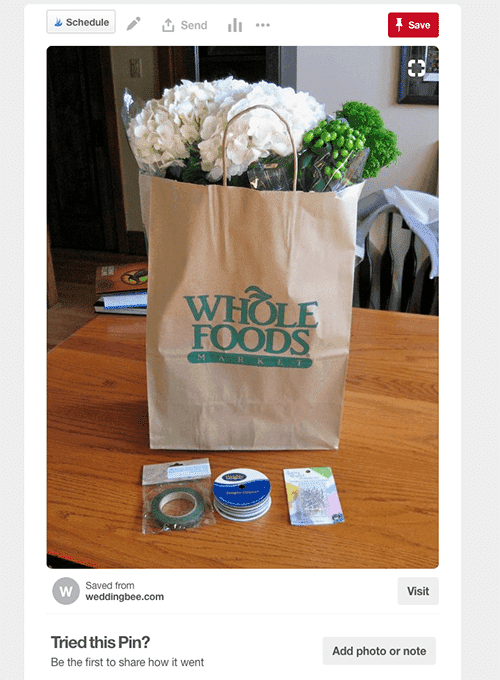 But, it’s all too easy to caught up in “Pinterest Perfection”: the belief that anything you try from Pinterest isn’t any good at all unless it’s as perfect as your inspiration pin. And it can seem like a young woman’s game, particularly if you’re a midlife bride planning a wedding. I just did a search on Pinterest for “midlife bride” and the pickings are still pretty slim. They were even slimmer when I was planning my own wedding two years ago. Stress-Free! There would be no staying up all night the night before my wedding making centerpieces for the tables. Cost Effective. There would also be no four-figure flower bill. Flowers were strictly DIY. But easy DIY. Reflecting Our Personality. 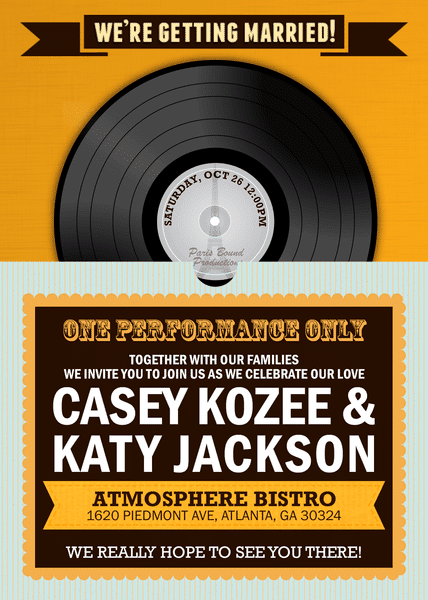 Casey and I both share a strong love of music. I wanted our wedding to reflect that wherever I could weave it in without being too “theme wedding”. Love. I wanted the day to be a reflection of our love for each other and our love for the friends and family we asked to share the day with us. And I had a final goal that I was a little embarrassed about. But it was important to me. I wanted to wear a long white dress. 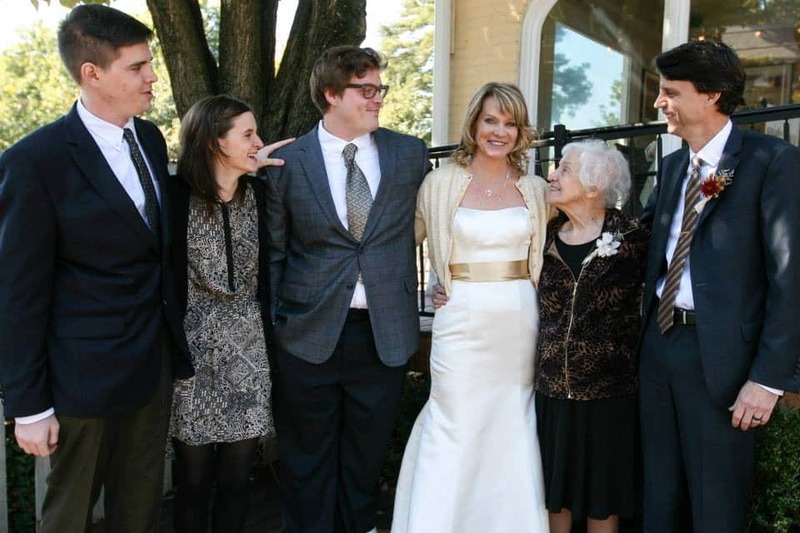 I wore a tea-length plain white cotton Laura Ashley dress to my first wedding. There are a lot of reasons why that happened, but the bottom line is I always felt cheated out of my princess day. I didn’t need a full-fledged princess day, but I wanted a long white dress that was appropriate for a 52-year old woman. I also didn’t want to show my arms. Nobody wants to see the bare arms of a 52-year old woman. At first, I just used the board as a sort of mood board; pinning whatever struck my fancy. And then as the date got closer I started keeping a notebook of all the elements of the wedding along with the inspiration pin. For example, here’s the pin I finally chose to emulate for our wedding invitation. I created our wedding invitation in Illustrator using the pin as inspiration. And I made things even simpler. 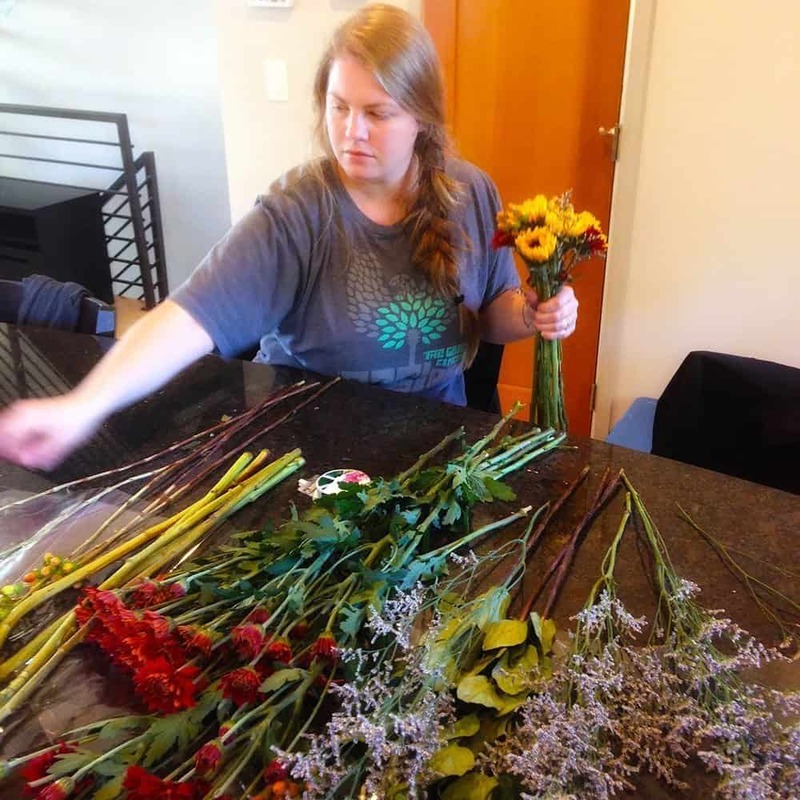 Instead of Whole Foods, my florist was the local farmer’s market and instead of creating the bouquet myself, I outsourced the job to my beautiful niece. I think you’ll agree she did a fabulous job. 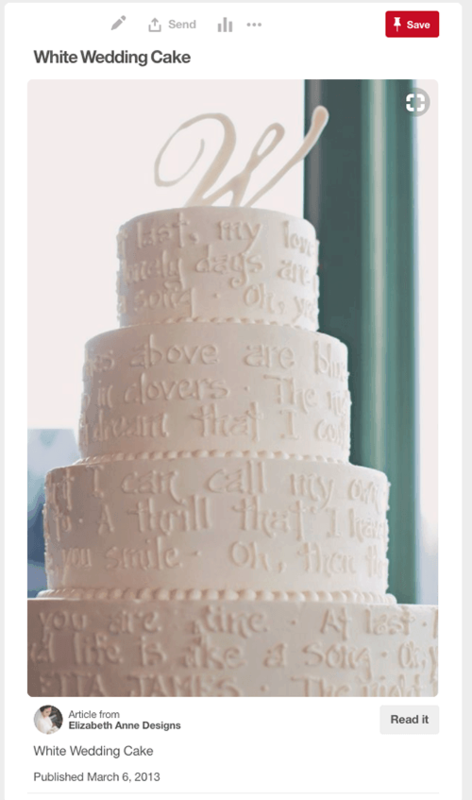 This pin was completely perfect as inspiration for a cake that showed our love for music and each other. Casey and I dated for a little bit in college and then remet 30 years later so the chorus, “This Will Be Our Year, Took a Long Time to Come” has a lot of meaning for us. As for the white dress appropriate for a middle-aged woman? It took a few pins to cobble together just the right look. First, the actual dress. I wanted something simple, elegant and timeless and this dress was just the ticket. 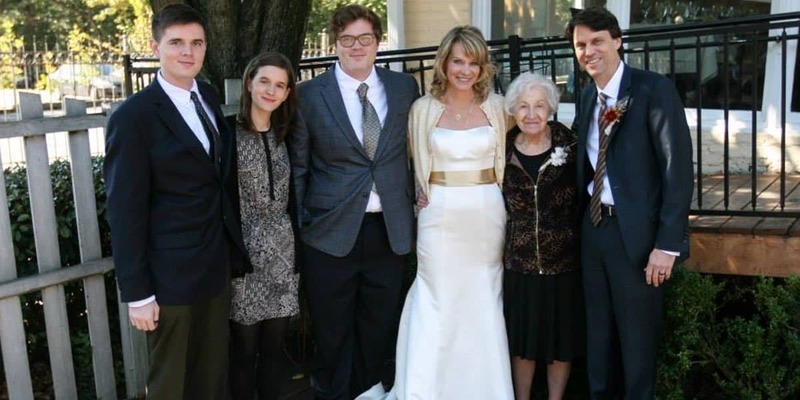 My wedding day was one of the happiest days of my life. 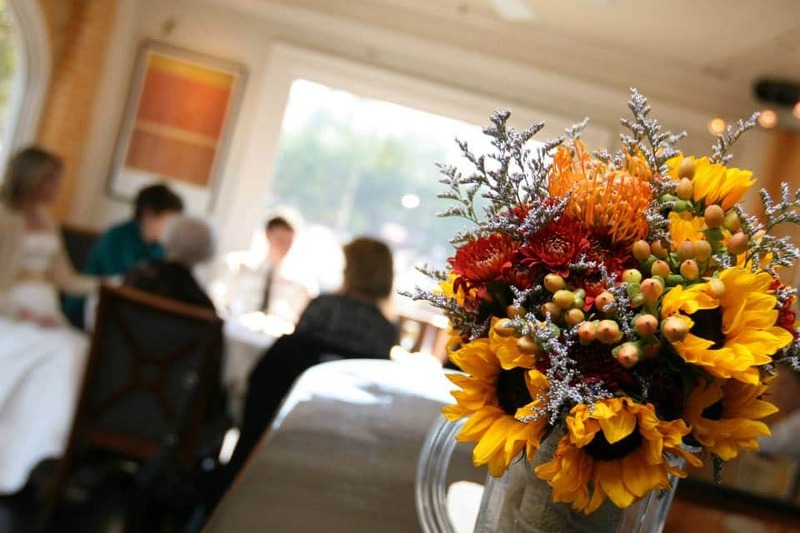 We had the wedding in a lovely French restaurant in Atlanta and the food was so delicious. It tasted like love, I swear. As a wonderful added bonus, the building had, in a previous life, been my father’s office so I could feel his presence blessing us even though he’s no longer with us. You can’t find that stuff on Pinterest. But a pretty cake and a princess dress can help make a special day even more special. I’m going to pin this! Love that you started your board as a secret board and I love your dress. Almost makes me wish I didn’t elope the second time….almost. 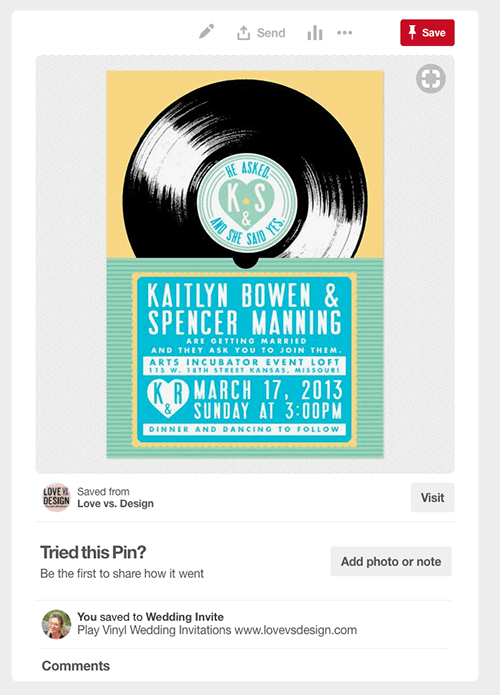 I had no idea what a Pinterest wedding was until I read your post. Interesting! Oh and by the way? You are still a newlywed. I wish you many happy years! 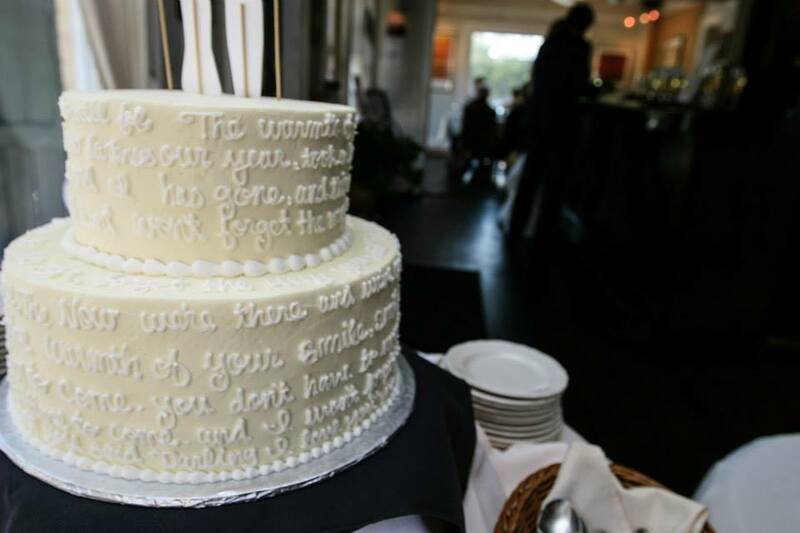 I love all of your ideas and that cake is beautiful. The wedding looks perfect! Thanks Marcia. It was a lot of fun and nice to relive it. Pinterest wasn’t around for my second wedding- I wish is had been. However, like you my second wedding was the wedding of my dreams and low drama. So much better without the drama, isn’t it? I love your wonderful story and your photos are just fabulous! Taking notes because I’m planning my daughter’s wedding for next May. Tell your daughter Best Wishes from me. Have you guys started watching all the TV shows yet? They’re such a hoot. WOW! You look beautiful. You have to love Pinterest right? I love the wedding cake what a great idea. Thanks for sharing. Pinterest is great even for those of us who might be just a tad older than the standard bride 🙂 Thanks for the kind words – it was a lovely day. Katy, thanks for sharing your great ideas! When my hubby and I were prepping to tie the knot three years ago, I scoured Pinterest too for second time around weddings. Your dress is gorgeous and perfect for you! We ended up having three small receptions, (I think it’s on Pinterest how I pulled that off), with one at the church (helps to have an 11am Thursday wedding–no alcohol, just cake). The second reception was three days later in San Diego where most of our families live, then third was at our windsurf campground. Alcohol flowed during those, and so much fun to celebrate three occasions with different folks! That’s so awesome! Thanks so much for sharing and if you’ve got a post or photos I’d love to see them. Thanks Gilly! In the end I’m glad I had a sweater because the day was seriously chilly. But I suppose I gave in a bit to my insecurities there. 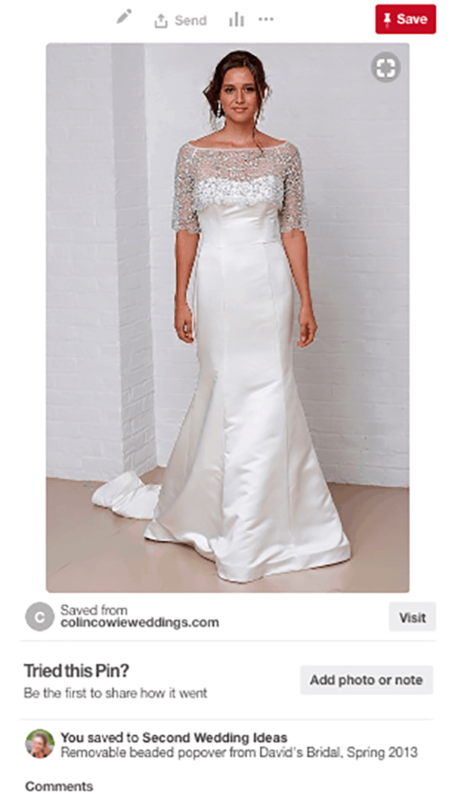 At the time you seriously could not find a brides dress that wasn’t strapless – I’m happy to see they’re bringing back a bit more variety now.